When a Tarot card with the number three in it appears, one of the layers of meaning involved in it applies to this number itself. Threes in Tarot signify a unifying force. The number three is entwined with the couple it takes to birth new life. 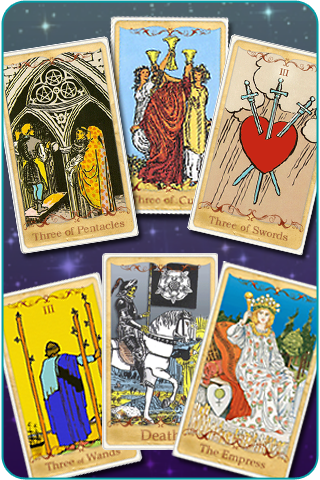 There are six cards in the Tarot deck featuring this number: the four suited cards (Three of Swords, Wands, Pentacles and Cups) and two cards from the Tarot’s Major Arcana: The Empress (card number three) and Death (card number thirteen). Themes that these cards reinforce include loyalty, bonding, indulging and crossing the point of no return. Loyalty: The theme of being beholden to an oath, a relationship, a tradition or a way of doing things underscores both consistency and commitment. You may be feeling particularly comfortable because of the solid beliefs and actions you hold. You might, though, be feeling a little stuck in the mud if you have grown beyond a certain outlook on life. Bonding: The love we have for a group, a belief system, a team, a type of artistic or creative expression, or some other set of ideals can bring us together with others like little else. Bonding with others from diverse backgrounds over a common locus allows us to broaden our perspective while maintaining a stable point of focus and comfort. Indulging: We can swoon into deep sentimental pools of self-pity as easily as we can pursue a journey of the path of excess. Getting all we can, feeling as deeply as possible, consuming all there is to be had … indulging is an act that starts off as a casual visit and turns into an extended stay. There is no commitment made at the outset of an indulgence; we stay, though, because of the seductive power of the thing we try, be it food, lust, narcissism or worse, as well as because of our own human weaknesses. Crossing the Point of No Return: All of the traits of the cards numbered three have a certain inevitability built into them. 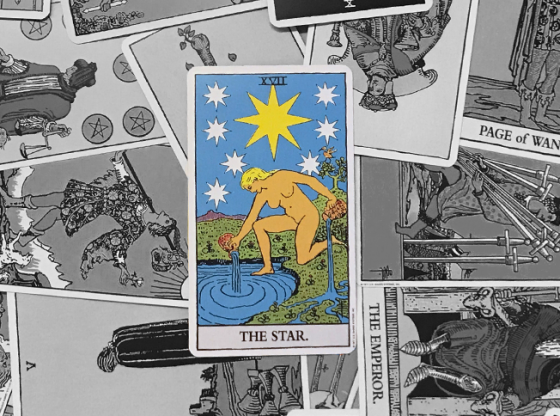 Like puberty, marriage and divorce, a Tarot card with a three on it is more than just an affirmation to move on. Cards numbered three are not just a line in the sand; they are the crossing of that line and the steps to move far beyond it. At its most intense, any card with the number three carries the power of complete and total transformation. 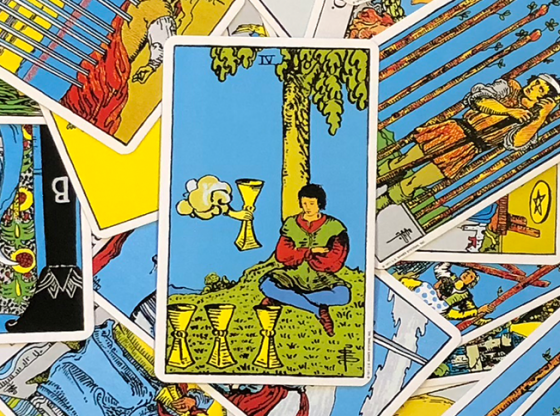 If you receive one or more of these cards in a reading, understand that change will do you good, but that the process of changing might be more intense than you ever anticipated. 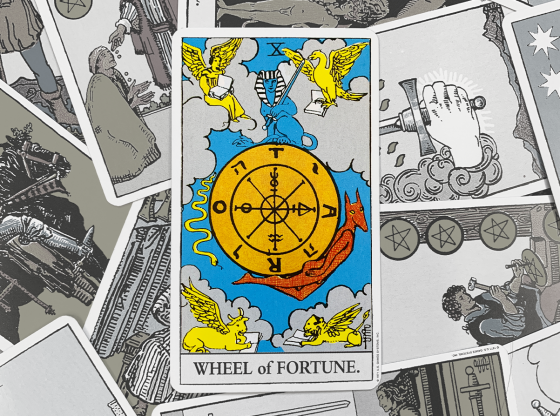 These themes are imbued into each of the cards numbered with a three in the Tarot. When one of these cards appears in your reading, some of this energy is apparent. 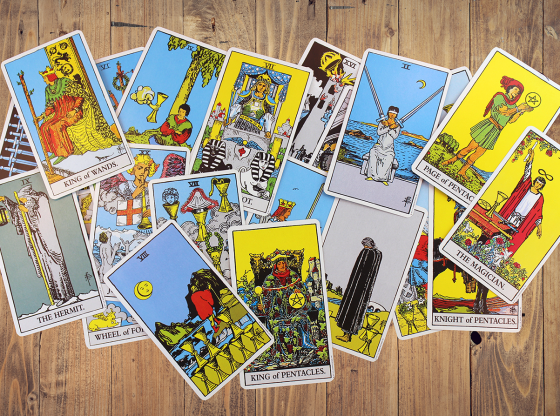 When there is more than one of these cards in your reading, these themes will be a major current in your life quite soon. 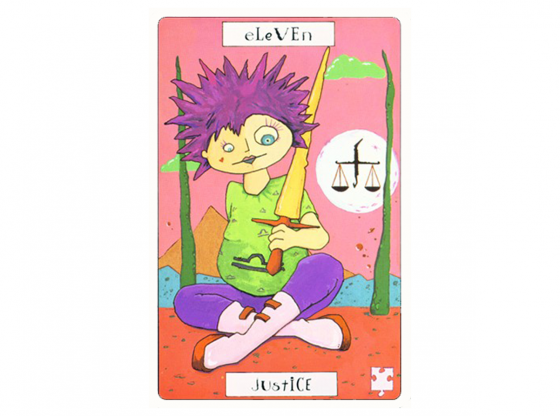 This is the highest ranked card of any numbered with a three in all the Tarot deck. The Empress sits on her throne, with everything and nothing to command. She is beholden to The Emperor and is not aware of the luck or power her position holds. She is at heart a pleasure-seeker. When The Empress card appears, the themes of loyalty, bonding, indulging and crossing the point of no return are emphasized not like a crashing tidal wave, but more like a fattening, irresistible, delicious box of chocolates that suddenly get consumed two and three at a time with little attention to what makes each delightful treat special unto itself. This is the scariest card in the Tarot deck. 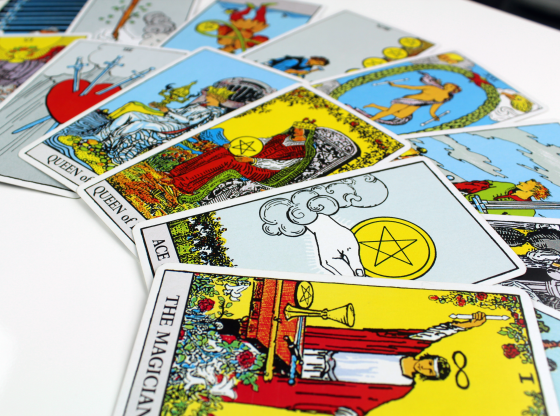 Death was once much more common in everyday life as antibiotics and common surgeries of today were not around when the Tarot was codified. 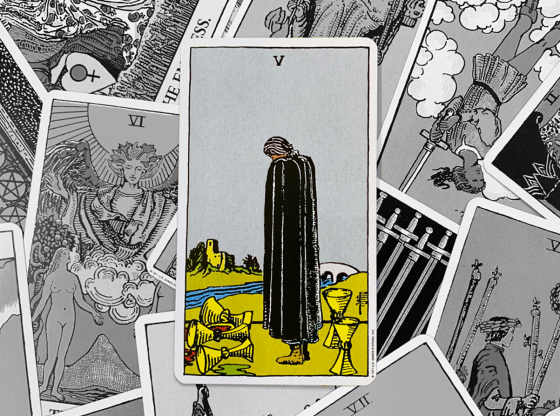 The card might signal the end of a life but that life could be as a single person, or relate to the end of a job or some other all-consuming endeavor. 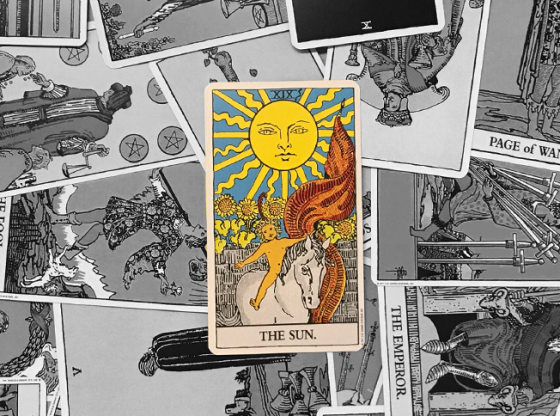 Where The Empress prefers to seductively deliver bonding experiences, indulgences or the crossing of a line, the Death card has no such finesse and indicates that these transformative experiences are arriving in a severe manner. This is a card that serves up transformation in a way that will take with it every inessential thing in your life and sweep it away. 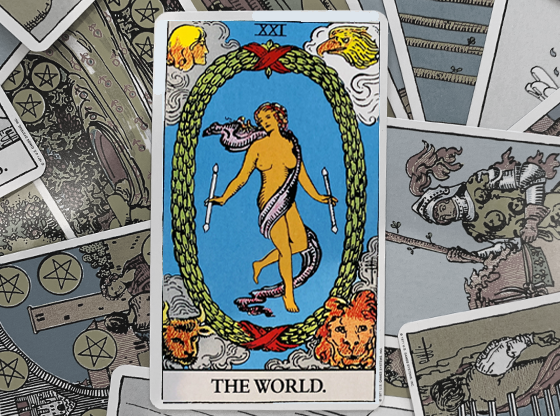 The Three of Wands is the card of extreme confidence in crossing the line. Your belief in your own creative process allows you to form the bonds that take you to the next level. You envision what you can become when your loyalty is recognized. You indulge your vision and dare to dream. This card indicates that you are about to envision crossing that line. When the Three of Wands is in your reading, the walking sticks that represent your creative and entrepreneurial impulses are set in a manner to take you places you are only beginning to dream possible. The chance to bond with others is one of life’s great pleasures. There are many hours of loneliness in life, and more still of being involved in a partnership. None of us choose the family from which we come and with whom we are often forced to interact. But we can choose our friends and select our acquaintances, and the time we invest into these relationships. The Three of Cups underscores a bonding process that is thoroughly enjoyable. A gloomy card indeed, the Three of Swords illustrates the three swords piercing a heart against the cloudy grey of a sleet storm. The deep indulgence of feeling sorry for yourself after loss can transform your life into a pity party. Narcissism is the state of mind that puts your suffering as the paramount tragedy. This card can represent your own self-destructive urges as much or more than the changes in your life foisted upon you by fate. Begin at the beginning. 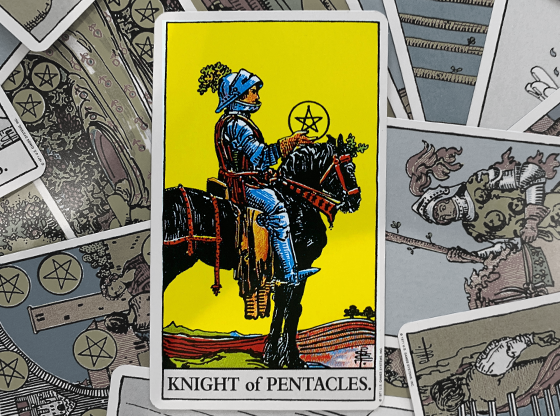 The Three of Pentacles is a card that acknowledges the coming big changes but underscores the discipline in waiting for big things to be built on a solid foundation. To build a cathedral is an undertaking of immense complexity and cooperation. We bond and stay loyal to the task when we seek to make our own heaven on earth, be it in a relationship, a social group, a condo association or any other long-term interpersonal interaction. Pentacles represent the material world. The transformation of this card is a slow process, but it is the most complete of any of the four suited Tarot cards numbered three.